I decided to follow a different branch of the rough back road into the Tumacacori Mountains than I had been using in times past. My traditional route had one spot that always caused my truck to scrape its frame. The new route led to a rather nice camp spot, which was about 2 miles away from the old camp spot on the old route -- and I did not have to scrape frame to get there. My eleven year old son Bennet and I were seeking javelina for the next week in unit 36B. On my last deer hunt here, I had encountered javelina herds on three separate occasions over the course of a week. About an hour after setting up at New Camp, a family of hunters, all on quad ATVs, came rumbling past our camp, but we saw no other trucks come our way for the next week. After exploring in all directions from New Camp over several days, we had yet to lay our eyes on any desert pigs. Oh, we thought we had caught a whiff of mildly skunky odor one evening, but a quick search before dark, and a more thorough search the next morning, did not pan out. We also visited the one javelina herd site that lay between New Camp and Old Camp -- several times -- but of course they weren’t there anymore. So we decided to walk to Old Camp, because the other two herd sightings were in the vicinity of Old Camp. Like I said, Old Camp was two miles away, and since we hunted our way there, it took us until just before lunchtime to get there. We sat down under an oak, pulled lunch out of our backpacks and enjoyed a peaceful picnic in the wild. We then climbed to the nearest high spot to take a look around. After about 45 minutes of glassing, we realized that we needed to start heading back to New Camp because the walk back would consume the rest of the daylight. Though we did make it as far as Herd Site Two, we did not have the time (or maybe the energy) to press the further mile toward Herd Site Three. A while back Dan asked me to write an article about hunting with All Terrain Vehicles (ATV's) and I finally have gotten around to it. 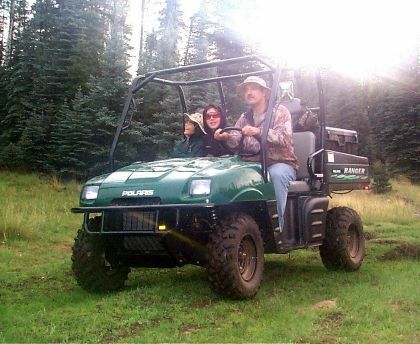 I have used ATV's on my hunting trips for about ten years now. I love the freedom they allow in getting from camp to hunting area or from hunting area to hunting area. I do not own a four-wheel drive vehicle and usually take my truck and cab-over camper on my hunting trips. The combination of a cab-over camper and a non-four wheel drive vehicle can limit you on where you make camp, especially in the desert, or up in snow country. One of the things I like about ATV's is that there is no shortage of accessories, which makes the ATV all the more versatile. I have a gun boot for holding my shotgun or rifle when I carry them and also gun racks that I use for my bow when I am hunting with that. My buddy purchased a hard-sided box to mount on the rear of his and we use this to carry any extra clothing or hunting accessories along with us. ATV's can be more comfortable to ride then a vehicle and can usually get you to your destination quicker, in rough terrain, which there is no short supply of in this state. However, in colder weather a vehicle is definitely more comfortable. 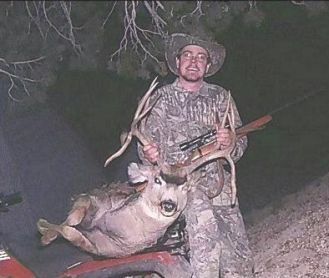 An example of this is when I hunted in the Kaibab in late November and the morning temperatures were in the low thirties. Couple that with the wind chill, which probably put you in the single digits, on a 15-mile ATV ride and you find out where you are lacking protection from the weather. Another nice thing about ATV's is the gas mileage. I do not have an odometer on mine but I imagine I can get about 40-50 miles to the gallon. I can usually travel around for three to four days between refills since I mainly use the ATV to get me as close as possible to my hunting areas and go out on foot after I park. Of course, as you all know, they come in various sizes and types. I have an older model, which is only a two-wheel drive. However, if I were to purchase another I would get it in four-wheel drive. I have been in some tough spots and needed help from my buddies to get up some steep trails. My friend's four wheel drive ATV climbed the obstacles with ease. We have the four stroke motors since they are a lot quieter which works well for hunting. Most modern day ATV's have centrifugal clutches or are completely automatic which makes them very easy to drive especially in steep terrain. Just last weekend we used the ATV's to set up our tree stands for the upcoming archery deer and elk seasons. My hunting partner had borrowed a little trailer to use and it worked really nice for hauling the tree stands and the equipment to get them installed. They also work very nice for retrieving your game. I have had the opportunity to carry out a deer on one and numerous javelina. I have yet to haul out an elk with one but my brother has done so with his ATV in Idaho. A side benefit to ATV's is it helps entertain the wife and kids when I am out archery hunting in the woods. They'll hop on them and go for rides during the day while I am out hunting or they will give me a ride to an area where I am going to hunt and come pick me up when the sun goes down in the evening. Some times I get lucky and they'll have spotted some game in an area and I'll go hunt that the next day. 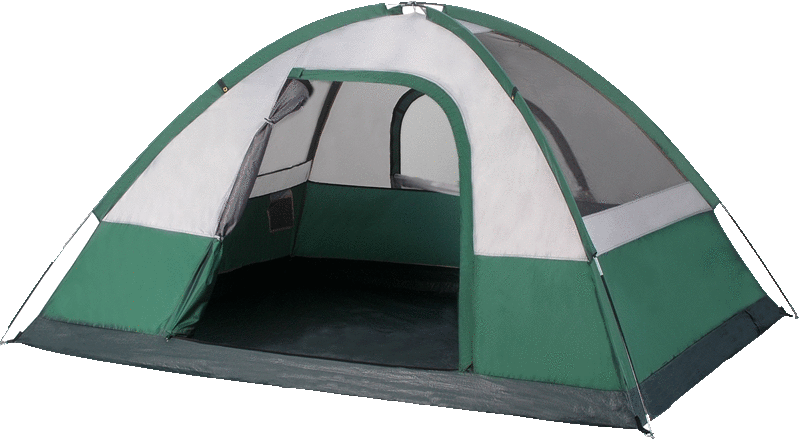 They also are fun to take out when you're camping in the woods during the summer to scout out new areas to hunt. We also like to take them out in the desert during the cooler months for sightseeing and group excursions. 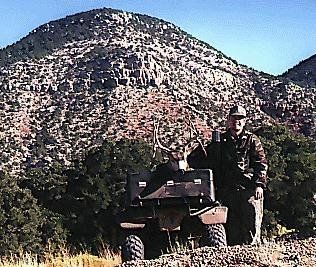 Game & Fish and Arizona State Parks have a nice pamphlet, which gives a brief description of some of the laws concerning ATV's and their use in Arizona's public land and roadways. I recommend you pick one up if you are interested purchasing an ATV. At the first road we hit on the way back, we ran into another hunter on a quad ATV. We talked a bit, showed him where he was on a topo, and we bid each other a good hunt. We stopped and glassed from different vantage points as we hunted back to camp, again without seeing anything, but this walk back was significant because it’s the first time I really started seriously thinking, "I need an ATV." If we had an ATV, we could have traveled the distance from New Camp to Old Camp in minutes, easily negotiating the frame-scrape point. We would have had all day to explore the vicinity, including Herd Site Three. I knew though, that it would take a different kind of ATV than the common quad. All quad’s are essentially one-man vehicles. I know that some folks routinely carry a passenger on their quads, but every manufacturer warns against the practice as being unsafe. 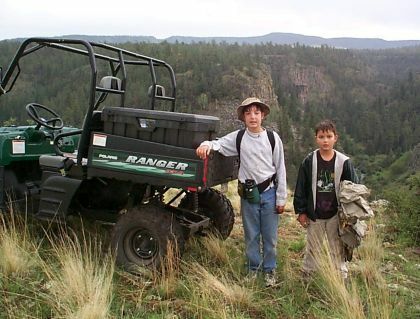 But since I have two pre-teen up-and-coming young hunters, an ATV designed for carrying passengers was what I needed. Nobody has yet come up with a name for this class of vehicle that has stuck. Some names I have seen used by different manufacturers are "Multi-Seat Cargo Vehicle", "Trail Utility Vehicle", "Super Utility Vehicle", "Off Road Utility Vehicle", and "All-Terrain Utility Vehicle". The class was defined by Kawasaki when they introduced their Mule utility vehicle back around 1989. Since then, a number of manufacturers have entered this market with similar vehicles. The various manufacturers all come at the market from different directions. Both the Kawasaki Mule and the Polaris Ranger entered this market from the ATV direction. The Toro Twister comes into the market from the riding lawnmower angle. John Deere brings their Gator to the party from the small tractor and farm implement market. EZ-Go and Club come to the market from the golf cart world. In fact, the shorthand description I use when I’m trying to describe this type of vehicle to someone, is "four wheel drive golf cart". On the way back from a Woods Canyon fishing trip with the kids, I stopped in Rye at Four Seasons Motorsports. They let me test drive a Polaris Ranger 4x4 and I was hooked. Although I ultimately bought my Ranger in town at Metro Motorsports, I recommend that anyone thinking about a Polaris or Yamaha ATV give Four Seasons a chance. They treated me well and they will even deliver your ATV to Phoenix if you buy there. I suppose I must admit that I did not do as much pre-purchase research as I should have. But post-purchase research only confirmed that I had made the right decision with the Polaris. Of the vehicles in the class, the Polaris has the greatest horsepower (30), the most capable suspension system (6+ inches front and rear), the highest top speed (40 mph -- all the others top out at less than 25), the greatest load capacity (1500 pounds total, 1000 in the bed), the greatest towing capacity (1500 pounds), and the greatest seating capacity (3 across). The Ranger’s 4WD system is really a switchable on-demand AWD system. You can run in AWD all day long, but the front wheels are only engaged when the vehicle senses slippage in the rear wheels. You can also lock the rear differential with a dash-mounted locking lever. Power is fed to the rear wheels through a dual-range Constantly Variable Transmission (CVT). This is a belt-driven torque converter type automatic transmission. You are warned that low range is the vehicle’s primary driving range. High range is reserved for hard pack surfaces with a light load. Lugging the vehicle in high range can lead to belt slippage, belt overheating, and ultimately drive belt failure. Once you understand the design limitations of the CVT, you’ll learn to choose the right transmission range for the situation. Low range will take you up to about 18 MPH before the engine starts to feel like it’s revving too high. The entire purpose of the vehicle is to take you places on roads where 10 mph might toss you out of your seat, so practically speaking, this is not a limitation. As mentioned, the Ranger seats three across, and does so comfortably. The Ranger is about 60" wide, almost as wide as your typical compact car. It’s much shorter though at 113 inches. I had to get a trailer with internal dimensions of 6 feet by 10 feet to comfortably fit the Ranger. Polaris says that it will fit in the bed of a full size pickup with the tailgate down. The 500cc single cylinder powerplant is located amidships underneath the seat. The undercarriage is fully protected with a full length composite skid plate. The machine is braked at all four corners by hydraulic disks (best-in-class braking system). The Ranger is equipped with a tilt-down pickup box with a tailgate. The entire box is made of tough plastic and measures 53"x38"x12" internally. On our first trip out to the desert with the Ranger, we found that dust has a way of swirling into the pickup box, so I picked up a large plastic cargo box with hinged lid (Contico) at Walmart for $35 which I bolted into the Ranger’s box. The Contico box takes up about 40% of the bed’s floor area, but I figure that I could still transport a deer back there. A full roll cage surrounds the cockpit, but Polaris’ lawyers put a statement into the owner’s manual that says that the roll cage was not designed to protect the occupants! For ease of manufacture I suspect, the roll cage is made in several sections. The sections are joined in six locations with pop rivets. These joints have an annoying habit of squeaking and creaking as you negotiate road obstacles. For our second outing with the Ranger, we went up to the White Mountains for a weekend. Unlike down here in the desert, the White Mountains have been getting good rain. On both Saturday and Sunday, we were hosed down with intermittent showers. The good news was the rain quieted down the roll bar’s creaking! The water in the joints acted as a lubricant. I think I’ll try injecting some WD-40 into those joints to see if that helps on dry days. I swung a deal with Metro Motorsports to buy the Ranger at the same price as Four Seasons’ out-the-door price, but to toss in two gun boots plus a bed-mount dual gun boot bracket. Well this won’t work anymore now that I’ve got that Contico box bolted down back there. What I’ve decided to do is to simply use standard rectangular hard sided gun cases bungeed to the top of the roll cage. The policy for driving motorized vehicles on this National Forest is tied to the State of Arizona's motor vehicle policy. On all state, county, and those forest roads marked by a horizontally-numbered route marker (ie 249), the motorized vehicle and its driver must be "street legal." On unmarked forest roads or forest roads that are marked by a vertical route number, the driver and the vehicle do not need to be licensed. Driving off of forest roads is not encouraged but may be legal if no damage is done to plants or soils or if wildlife is not harassed and if a muffler/spark arrestor is in place. To make the Ranger "street legal," I only had to add a rear view mirror, a horn, and a lighted license plate bracket. I figured it was worth taking the extra steps to legalize the Ranger for the convenience of being able to run the major Forest roads whenever I thought I needed to. I didn’t want to have to deal with that nagging worry, "Am I going to get caught and ticketed if I take that road?" One place I cannot go with the Ranger, paradoxically, is on designated ATV trails! The Forest Service has recently finished construction of a designated ATV trail in the area that I have been turkey hunting for the last 8 years or so. The problem is that it is limited to vehicles less than 50" in width. They even strategically place large rocks on either side of the trail to weed out anything wider. Oh well. While we were up in the White Mountains, we took advantage of our street legality to test the Ranger on a major graded road. The Ranger is not equipped with a speedometer or odometer, just an engine hour-meter. We put the Ranger in high range and using a GPS receiver, we clocked ourselves at a max speed of 33 mph. The break-in period is defined as the first 20 hours of operation, so we’re trying not to push the machine too hard yet. There was only one spot where we pushed the machine a little. We were crossing a stream with a steep opposite bank. As we started climbing out, I realized that I should have had 4WD engaged as the rear wheel started spinning over a large rock. We started slipping backward and there was nothing else to do but mash the gas pedal. The rear wheel finally caught and propelled us over the bank. Some other modifications I’ve made are the addition of hold-downs for two ammo cans underneath the "hood". Mechanically, there’s the brake master cylinder, the air cleaner intake snorkel, and access to the radiator underneath the Ranger’s hood. Polaris could have made better use of this space for storage, but they didn’t, so it’s up to the buyer to figure out how to. The ammo cans are for packing tools, tire repair necessities, and a first aid kit. Also, my street legal papers! The electrical horn I added is mounted here under the hood, and I also installed a gang of three cigarette lighter style DC power outlets. Sometime in the future I plan on mounting a GPS-connected Pocket PC running topographic mapping software. It will remove easily so I can take it with me when I leave the Ranger unattended. By the way, the Ranger starts with a key just like a car does in case you were wondering. Many years ago, in The Time Before Quads, a buddy and I went on an overnight "bikepacking" trip. We strapped on backpacks and took off on a 20 mile trip to the top of a mountain. I was riding a Honda 250 enduro dirt bike and he was on an original 3-wheel Honda ATC. It was such a sense of freedom to be there on the top with only our bikes and what we had brought on our backs. I’m looking forward to such adventures and many others with the Polaris.